Defenceman Nelson Armstrong snatched a sensational hat-trick to steer Milton Keynes Lightning to a vital 5-2 victory over fellow strugglers Manchester Storm at Planet Ice on Saturday. The American’s straight hat-trick was the first by a blue liner in Lightning’s Elite era – deservedly earning him the man of the match award. It was Armstrong’s first goals in the Elite League – his only other strike being in his second game for the team, a Challenge Cup 5-4 loss to Cardiff Devils. New signing, Ivan Šijan made his home debut for MK, the 6ft 3in player presenting an imposing presence on the blue line while not afraid to join the offensive play. It was Lightning’s only game of the weekend - the win moved Lightning closer to third from bottom Manchester in the rankings. Unfortunately second from bottom Dundee Stars’ 4-2 success over Coventry Blaze meant that MK remained at the foot of the table. Storm started brightly but were hindered by holding penalty on Harrison Ruopp after 1min 36secs – Lightning unable to capitalise on the powerplay although Radek Meidl went close with a shot which was blocked by netminder Matt Ginn. The visitors made Lightning pay when the hosts were caught with too many men on the ice as Evan Richardson set up Luke Moffatt for rocket shot from just inside the blue line to beat goalie Patrick Killeen on 4mins 36secs. As the period went on, Lightning got into their stride, although Dane Byers twice threatened in the 14th minute. His first effort was deflected away from danger and the second was safely gathered by Killeen. Georgs Golovkovs and Cole Shudra then had worthy attempts before Rob Linsmayer was sidelined for hooking in the 17th minute. On the powerplay David Norris passed from the left to find Armstrong at the right pipe to crash the puck home on 18mins 52secs. 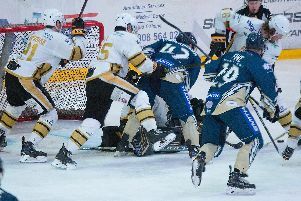 MK quickly had a further powerplay chance when Byers was sin binned for roughing right at the end of the period – the penalty spilling over into the middle session. Although Lightning failed to convert with the man advantage it was not long before home fans were celebrating the go ahead goal. It came when Norris found Armstrong advancing forward to blast the puck into the goal at 22mins 42secs. MK survived a penalty on Ivan Šijan for tripping and they then extended their advantage with an excellent shot from the edge of the circle as Armstrong completed his hat-trick at 27mins 6secs. The goal prompted an immediate timeout by Manchester – It did them little good because within 50 seconds they conceded again. This time Shudra and Norris were involved in Owen Griffiths’ strike after 27mins 47secs to make it 4-1. There was a glimmer of hope for Manchester when Evan Richardson scored from Ciaran Long’s assist on the powerplay at 37mins 53secs – Harry Ferguson serving two minutes for slashing at the time. However, despite a period of Manchester pressure early in the third period, the chances of a turn around in the score dwindled as the game reached its final stages. Their hopes were not helped by a penalty on Moffatt for a high stick on Tim Wallace and an interference call on Linden Springer who drew blood for his offence on Šijan. That call also led to a 10 minute misconduct penalty on Storm’s assistant coach Mike Morin. Down to three skaters Storm were punished in the best possible way – Golovkovs seemingly looking to pass to his left when he instead fired high into the net with 1min 44secs remaining. The win consigned Storm to another loss on the road – their only away success so far dating back to September.